He Shoots, He Saves by Jon Waldman. From the publisher: Whether it’s a ticket stub from a game that father and son saw together, an autographed photograph from a hero, or a puck that went up and over the boards, hockey memorabilia is a record of our beloved sport’s history. He Shoots, He Saves looks at hockey’s collectibles from hockey cards to commemorative beer cans to postage stamps. The book features artifacts from all 30 NHL teams, the greatest players of all-time, the WHA, the international game including the Summit Series, and the women’s game. Hockey greats such as Martin Brodeur, Frank Mahovlich, Ted Lindsay, and Sidney Crosby recall their own days collecting and offer their perspectives on memorabilia. 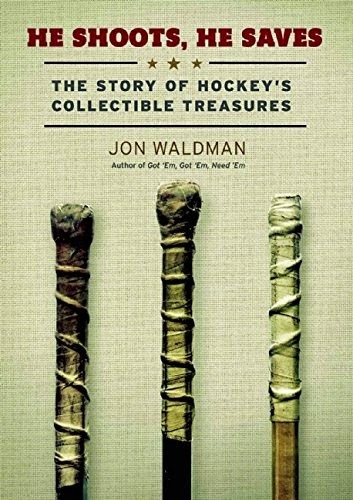 Joe's Take: This is an interesting book in that while it is very much about hockey collectibles, it is also a very neat introduction to the history of hockey. The book's first 70 pages or so look exclusively a hockey collectibles throughout the years, touching on the obvious like hockey cards, books, magazines, pucks, pocket schedules (I never really understood that fetish) and arena artifacts but also looking at some of the more oddball collectibles like bottle caps, stamps, cereal boxes, and, of course, bobbleheads. In the next 300 pages the author gives us brief run-downs on each franchise (plus some defunct teams), key players and key moments in the game's great past. Waldman tries to tie memorabilia into the conversation, though at times it strays away from that. Never fear, the text is laced with dozens of photos of neat collectibles that make this book as fun to flip through as it is to read from cover to cover. Take a look at this book. Collectors will love it and any hockey fan can learn some hockey history in these pages.